Hey there, my name is Bram! I’m a passionate web developer based in Groningen, The Netherlands. I make stuff with my keyboard such as websites, games as well as server- and client-side applications. I also spend time on Github doing open-source things. Check my portfolio section for more information. Ever since the first time I installed a Linux distro and started programming, I wanted to make something that people love to use and looks pretty while they’re using it. This has motivated me to make websites like Werkmanrooster, a website that helps students find their schedule faster. And these principles have served me well, check out the portfolio section for more. Click one of the thumbnails to get the details of the project. Werkmanrooster or rooster.io is a small fullstack data-driven webapplication powered by Node.js to provide easier access to schedules for students. The idea started out small with a small crawler that went through the schedule site’s pages and made a database of all of the students. It has now turned into a schedule search engine that was programmed with other schools in mind. It was constructed using Node.js, Express.js, Jade, LESS, MongoDB and Tor. I’ve put 121 hours in the current version and put 500+ hours in an older legacy version. Making this one of biggest projects ever. To see the current working version visit Werkmanrooster.nl. 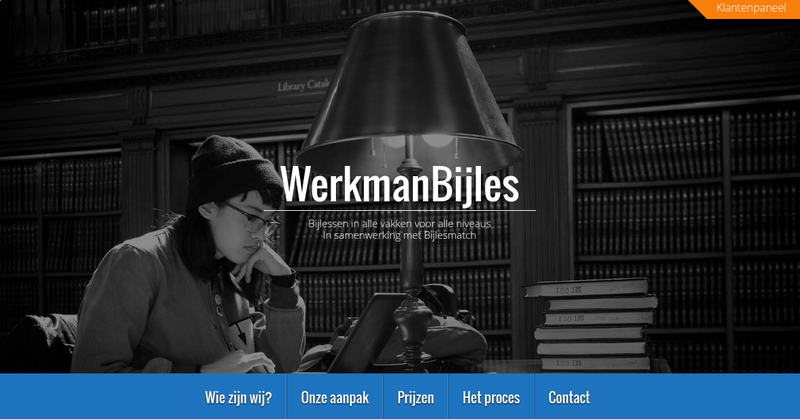 Werkmanbijles is a small startup that provides extra tutoring for students of Werkmancollege Stadslyceum. They approached me for advertising on Werkmanrooster and I suggested a website that would help their bussiness. This website is the result. Gmplayer was a follow up to yplayer with the same concept. This application however downloads from Google Play Music instead of Youtube. You just need to fill out ~/.gmplayerrc with your login information and you’re set! Use the command to either download and play with mplayer, or use the -d switch to download only and use it for mpd or something along those lines. It also supports the writing of metadata to the downloaded mp3 files, so that your songs are neatly organized when you browse through your library with your favorite music player. View this application on npm. With all the hype around No Man’s Sky, I decided to make a 2D version of the randomly generated universe game. A project of that size needed a generator that would generate all of the galaxies, systems, planets and more. So I looked around the internet for some abandoned projects and old code that I could blow the dust off of and re-purpose for my game. Galaxygen is built using Nodejs and the work of leowald, tweaked and upgraded for my project. Journally was created for my Linux workflow to have a prettified journalctl console on my desktop. It was made to be extensible and easy to configure. With simple stuff like colors and seperators and ignore lists, it’s easy to know what you’re system is doing at all times. Journally was built with Nodejs and is fully compatible with any journalctl system (Arch Linux, Ubuntu, etc) and support all journalctl commands. Yplayer was an experiment to see if I could write an entire CLI application on my Raspberry Pi with only Vim. It more or less taught me the essentials of Vim and how to use child_process in Node. It features the same design as gmplayer but this time with Youtube as a source. You can even download full videos and play them immediately via mplayer. Check out the npm for more information. Dropzone was a small project I started with when I was on vacation in Austria. It was a simple solution to sharing files easily without uploading and using no third party. The result was a working version that can instantly share files with your friends online and even preview files and stream them to them without downloading. However, due to the limitations of many NAT related libraries I’ve halted the development Dropzone since it cannot automatically port forward itself. Check out the Github for more information. Bridge was a simple project to see if me and my girlfriend could create a game. She created the asset and I used Haxe with HaxePunk and OpenFL to turn into a multiplatform game. The game has been compiled for both Linux, Neko and HTML5 in the development process and even has a version online. Spàààce was a project I used to learn OpenFL, Haxe, HaxePunk and related languages and libraries. I used assets from Kenney and music from OpenGameArt to get started and built myself a game. The game is a simple space shooter developed for Android but can also run on Linux, Windows, iOS, Flash and HTML5. You can contact me via my email, phone or github.